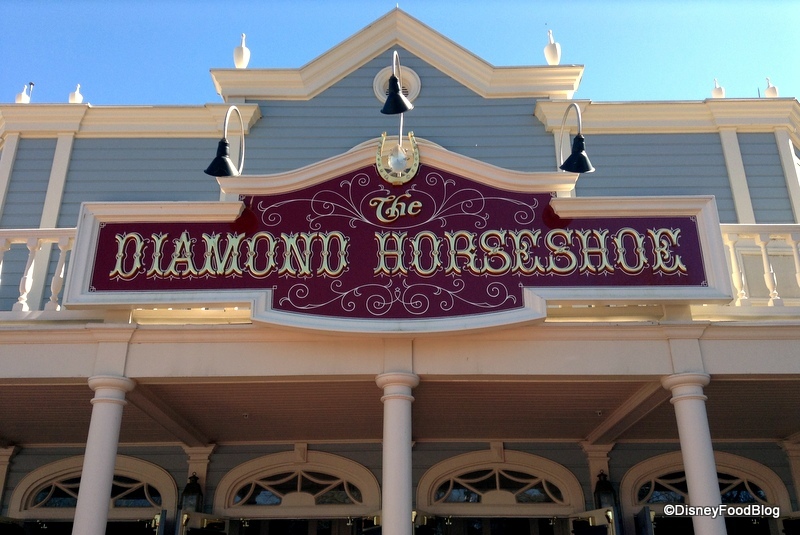 Located in Frontierland, the Diamond Horseshoe is open seasonally, and may or may not be open during your stay in Walt Disney World. Check the Disney World Website for the most up to date info. 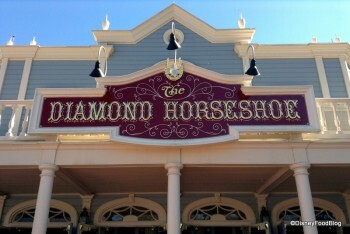 When it is open, The Diamond Horseshoe is usually a quick-service eatery during lunch and a buffet for dinner. At lunch, Guests can select from a menu of sandwiches (such as barbecue turkey and a hand-carved pork brisket for adults; turkey or PB&J for children) and sides, including a fruit cup and potato chips. During the dinner buffet, Liberty Tree Tavern favorites are usually served, including family-style platters of Saloon Salad (tossed mixed greens with strawberry vinaigrette dressing) and fare from the Ranchhand’s Feast (roasted turkey breast, carved beef and smoked pork loin with sides of seasonal vegetables, herb bread stuffing and macaroni and cheese). Disney Food Blog Review: Is the NEW Menu at Diamond Horseshoe in Magic Kingdom Worth a Visit? Diamond Horseshoe will occasionally be open during the Summer and sometimes in the Fall. The Diamond Horseshoe is also sometimes used for events at the Magic Kingdom, so if you see folks going in and out, that doesn’t necessarily mean it’s open to the public. Check with a cast member. Famous Dishes: Sandwiches, and family-style platter dinners. Review: Is the NEW Menu at Diamond Horseshoe in Magic Kingdom Worth a Visit?